There has been some confusion about how to make the Silverlight Unit Tests work on Windows Phone. The latest release of the Silverlight Unit Tests comes with the Silverlight Toolkit, and it targeted at Silverlight 4. Windows Phone is based on an enhanced version of Silverlight 3 and cannot use these DLLs. Fortunately, Jeff Willcox has made the right DLLs available on his web site. Be sure to put the unit tests inside the same project as the project you are testing, though it is good programming practice to isolate the tests in their own folder and namespace. Jeff Willcox has provided the following excellent way to turn on and off the unit testing by flipping a boolean in MainPage.xaml. In essence, if the boolean is true, then the unit tests become the content of the main page. This entry was posted in Essentials, Mini-Tutorial, SL Unit Tests and tagged Mini-Tutorial, Windows Phone, WindowsPhone. Bookmark the permalink. 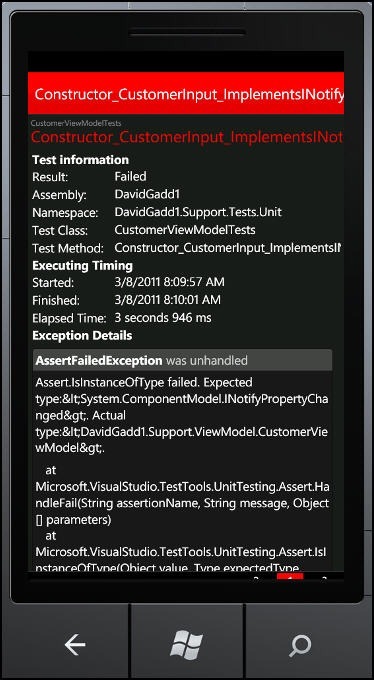 Thanks for pointing out the possibility to run unit tests for WP7, this is going to be very useful for getting quality apps developed. But can I ask you to make a blog post about WP7 and CI? My problem is that there is no SDK to install on the CI server and I don’t want to have to install the full WP7 development suite on my build server. I’ve tried copying across the build targets but it’s not really a practical way. It would be nicer if there were an SDK to install so the build server could build and continuously verify the project.